Patriots coach Bill Belichick heaped praise on the Eagles for what they’ve overcome to reach the Super Bowl. FOXBOROUGH, Mass. — If there's anything Bill Belichick respects, it's thoroughness. There's nothing that makes his warm heart warmer than a team that prepares for the worst, and overcomes it. When injuries beset his 2015 Patriots, Belichick and his coaches patched and filled and advanced to the AFC championship game. 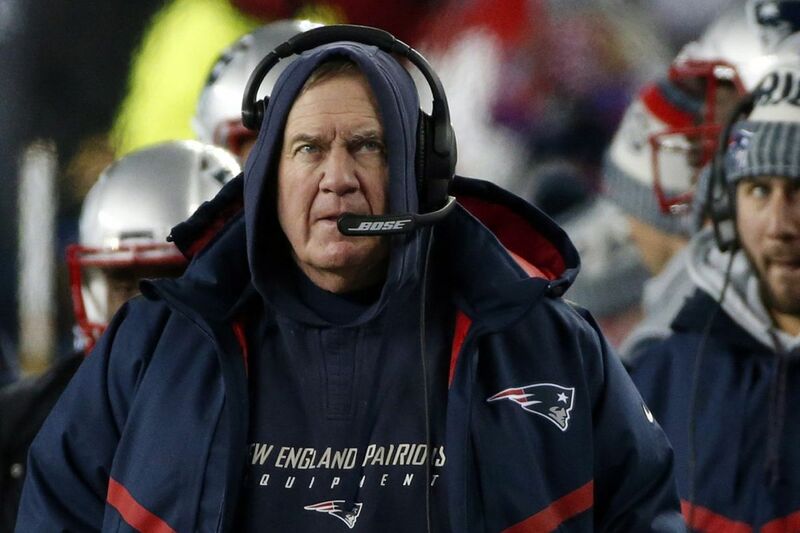 To no one's surprise, they had backup players ready to produce; after all, it's Belichick. The Patriots' injuries two years ago look like a case of the sniffles compared to the epidemic the Eagles endured this year. Belichick knows how hard it can be to remain competitive in a normal year, much less a year in which you lose seven of your first top 26 players for a significant amount of time. "Ton of respect for what they did," Belichick said Wednesday. "They really have played well all year, have dealt with some things that really haven't gone their way injury-wise, and had to make some adjustments. They've done a great job with that." It was strange to hear the coach who inspires so much awe speak with awe in his own voice, but that should underscore how unusual it is for a team with so many losses to have so many wins. This is the overriding narrative concerning the Eagles, at least it is outside of Philadelphia, where dog masks are the new black. Outside of the 215, people are talking about how Howie Roseman built a roster that Doug Pederson and Jim Schwartz coached so thoroughly that it remained the best in the NFL despite an avalanche of ailments that would have crippled other teams. "You've got to give credit to everybody – the people who put the staff together, the roster together, the staff, the players and just the consistency that they've shown," Belichick said. "They've been wire-to-wire. They've been the top team in the league, from opening week to here we are, down to the final competition." It's no secret that Darth Hoodie has made an art form of complimenting the opposing team; of using unseen forces that flatter the opposition into a degree of complacency; of coaxing teams into thinking they might be something close to equal. He is surgical in his comments. Every week, he provides detailed examples and cites specific strengths, whether it's the tight ends Dirk Koetter used with Tampa Bay in October or it's the backup running back Doug Marrone used with Jacksonville last week. Wednesday wasn't like that. Wednesday was different. Belichick had spent the last two days watching tape of the Eagles' unlikely season, and he is agog that so many understudies have played like stars. Belichick realizes that winning 15 NFL games with a 53-man roster despite losing more than 25 percent of the front-line players is simply amazing, especially since so many of the injured players were lost for the rest of the season. He gave the issue the attention it deserved. He studied it, like he studies everything else. He knows who left, and when, and for how long. The Eagles lost No. 1 cornerback Ronald Darby for eight games and kicker Caleb Sturgis for the season in the season opener at Washington, which would be enough for half of a season. But then they lost running back and punt returner Darren Sproles in Game 3; special-teams captain Chris Maragos in Game 6; and, in Game 7, future Hall of Fame tackle Jason Peters and middle linebacker Jordan Hicks. Finally — and, it would seem, disastrously — Carson Wentz tore his left ACL in Game 13. Disaster averted: Nick Foles led a comeback that game and is undefeated in his four meaningful starts. "The offense is the offense. I think certainly in Philadelphia's case, they didn't change the offense when they changed quarterbacks," Belichick said. "But Foles is Foles and Wentz is Wentz, so you want to make sure that you are ready for the guy that's going to play." Foles is only the latest understudy to provide unexpectedly strong support. Jaylen Watkins and rookie Rasul Douglas played well in place of Darby. Rookie kicker Jake Elliott replaced Sturgis. They signed Kenjon Barner to return punts, and undrafted rookie Corey Clement led the running backs in touchdowns. Kamu Grugier-Hill, a rookie special-teams demon, was a second alternate to the Pro Bowl. Halapoulivaati Vaitai played the best game of his life Sunday against Vikings defensive end Everson Griffen, and Nigel Bradham has had a career year at linebacker, where his responsibilities mushroomed when Hicks ruptured an Achilles tendon. They were all ready to play. They were all expected to play well, and did. "You have all these guys that go down," said Patriots safety Devin McCourty. "That usually hurts a lot of teams, but when you have a good overall team I think that believes in each other and each guy in that locker room, you saw it, they just kept rolling." "They've dealt with a number of situations on both sides of the ball. Even a player like Darby, who's back but missed half the year," said Belichick, whose star tight end Rob Gronkowski has a concussion that would have made him unavailable had the Patriots practiced Wednesday. "Look, every team in the league goes through something. We've had it. Every team we've played against has had it. But the Eagles have done a great job with it and they've continued to play very good football." They weren't perfect, of course. They lost Game 2 without Darby and Sturgis, but by the end of Game 3, when Elliott's 61-yard field goal beat the Giants, the team had clearly regrouped. In that game, the Eagles lost Sproles but began a nine-game winning streak as they absorbed the injuries to Maragos, Hicks and Peters. The next time they lost, in Game 12 at Seattle, they were as healthy as they have been all season — or, frankly, since. All the active Eagles are healthy right now, but no matter how well Foles plays, losing Wentz changed everything.